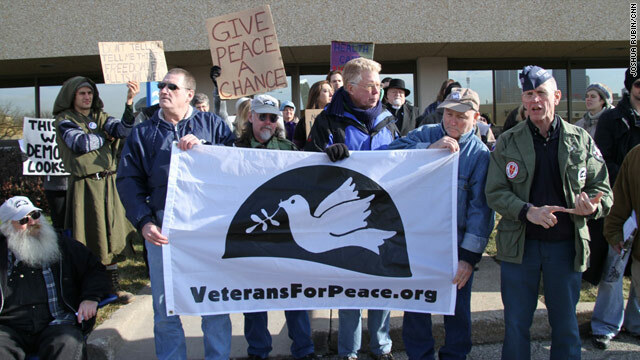 Des Moines, Iowa (CNN) - Occupy protesters in Des Moines were joined by members of Veterans for Peace outside of President Barack Obama's Iowa re-election campaign headquarters Saturday, calling on the president to end all foreign wars and cut the U.S. military budget in half. Using the people-powered megaphone the Occupy movement calls a "mic check," some 35 protesters spoke with a unified voice. "To fulfill the Occupy Wall Street movement's call to return our country's economic and political life back to the 99%, we will need a president who will make the dismantling of the U.S. military empire their number one foreign policy priority," they said. Protesters had planned to commit an act of civil disobedience, by entering Obama's headquarters and staying put, but were thwarted because the campaign office was closed. Rather than be discouraged, however, they said the closed office was a victory. "We know this office is open on Saturdays ... they knew we were coming, and President Obama is afraid to deal with us," said Frank Cordaro, a protester. A call to the main number at the Des Moines office was not answered on Saturday. As the Iowa Caucus heats up, so too will the protests in and around Des Moines. The local Occupy movement says it expects hundreds of people from across the country to join its protests in what is being dubbed "Occupy the Caucuses." these people should be taken straight to Jail – for about a 90 day span. Hilarious! There big plan was thwarted by a locked door. Give peace a chance? Of course. But when there are those who attack our allies and our own Nation and threaten to end the freedoms our country was founded upon, and for which thousands of U.S. Military veterans have fought and died for, we need to step up and defend our rights. But to keep cost of freedom down there are two basic rules: 1) when called upon, let the MILITARY conduct the process, Congress needs to simply give them what they need. The battle will be over a lot sooner with less casualties. And 2) – we fight to protect our freedoms and those of our allies. NOT for political reasons. Keep politice out of it. Sounds like a difficult issue – not really. Give it, and peace, a chance. wait for the Scarecrow. He is also looking for a brain. Toto, I don't think we are in Kansas anymore. The Iowalians were the first to endorse Obama!?! Now they can‘t see the reality that it’s the Republican Despots Boehner, Kantor, and McConnell who are blocking the President from getting anything done by taking the Unemployed and the Senior Citizens as financial hostages while threatening to shut the government down. I think it time U.S. Corporations started paying their Taxes instead of their Legislators, Lobbyists and Lawyers. KKK? The protesters are "calling on the president to end all foreign wars and cut the U.S. military budget in half." Then I really hope they are paying attention and throwing their support behind Ron Paul because he is the only candidate that will have this type of policy. All other candidates will keep feeding our military industrial complex. Nice to see that after serving some Vets. have not been totally brainwashed by the military! I support OWS movement and I also support President Obama. He is listening to what this movement has to say. None of the republican candidates are so to all the OWS'ers please be sure your not too hard on the President. He is one of the only ones fighting for us to make our Govt for of and by the PEOPLE instead of the GOP who has turned our Govt into for of and by the CORPORATIONS.